^ a b c Brown, Laurie M.; Pais, Abraham; Pippard, A. B., eds (1995). Twentieth Century Physics. Bristol; New York: Institute of Physics, American Institute of Physics. p. 1696. ISBN 978-0-7503-0310-1. OCLC 33102501. ^ Longair, Malcolm S. (2006). The Cosmic Century: A History of Astrophysics and Cosmology. Cambridge University Press. pp. 25–26. ISBN 978-0-521-47436-8. ^ a b c Russell, H. N. (1913). “"Giant" and "dwarf" stars”. The Observatory 36: 324–329. Bibcode: 1913Obs....36..324R. ^ Strömgren, Bengt (1933). “On the Interpretation of the Hertzsprung-Russell-Diagram”. Zeitschrift für Astrophysik 7: 222–248. Bibcode: 1933ZA......7..222S. ^ Schatzman, Evry L.; Praderie, Francoise (1993). The Stars. Springer. pp. 96–97. ISBN 978-3-540-54196-7. ^ Morgan, W. W.; Keenan, P. C.; Kellman, E. (1943). An atlas of stellar spectra, with an outline of spectral classification. Chicago, Illinois: The University of Chicago press. http://nedwww.ipac.caltech.edu/level5/ASS_Atlas/MK_contents.html 2008年8月12日閲覧。. ^ a b c Unsöld, Albrecht (1969). The New Cosmos. Springer-Verlag New York Inc. p. 268. ISBN 978-0-387-90886-1. ^ Gloeckler, George; Geiss, Johannes (2004). “Composition of the local interstellar medium as diagnosed with pickup ions”. Advances in Space Research 34 (1): 53–60. Bibcode: 2004AdSpR..34...53G. doi:10.1016/j.asr.2003.02.054. ^ a b c Kroupa, Pavel (2002). “The Initial Mass Function of Stars: Evidence for Uniformity in Variable Systems”. Science 295 (5552): 82–91. arXiv:astro-ph/0201098. Bibcode: 2002Sci...295...82K. doi:10.1126/science.1067524. PMID 11778039. http://www.sciencemag.org/cgi/content/full/295/5552/82 2007年12月3日閲覧。. ^ Schilling, Govert (2001). “New Model Shows Sun Was a Hot Young Star”. Science 293 (5538): 2188–2189. doi:10.1126/science.293.5538.2188. PMID 11567116. http://www.sciencemag.org/cgi/content/full/293/5538/2188 2007年2月4日閲覧。. ^ a b c d Clayton, Donald D. (1983). Principles of Stellar Evolution and Nucleosynthesis. University of Chicago Press. ISBN 978-0-226-10953-4. ^ Moore, Patrick (2006). The Amateur Astronomer. Springer. ISBN 978-1-85233-878-7. ^ Siess, Lionel (2000年). “Computation of Isochrones”. Institut d'Astronomie et d'Astrophysique, Université libre de Bruxelles. 2007年12月6日閲覧。 —Compare, for example, the model isochrones generated for a ZAMS of 1.1 solar masses. This is listed in the table as 1.26 times the solar luminosity. At metallicity Z=0.01 the luminosity is 1.34 times solar luminosity. At metallicity Z=0.04 the luminosity is 0.89 times the solar luminosity. ^ Zombeck, Martin V. (1990). Handbook of Space Astronomy and Astrophysics (2nd ed.). Cambridge University Press. ISBN 978-0-521-34787-7. http://ads.harvard.edu/books/hsaa/toc.html 2007年12月6日閲覧。. ^ Luck, R. Earle; Heiter, Ulrike (2005). “Stars within 15 Parsecs: Abundances for a Northern Sample”. The Astronomical Journal 129 (2): 1063–1083. Bibcode: 2005AJ....129.1063L. doi:10.1086/427250. ^ a b c Karttunen, Hannu (2003). Fundamental Astronomy. Springer. ISBN 978-3-540-00179-9. ^ Bahcall, John N.; Pinsonneault, M. H.; Basu, Sarbani (2003). “Solar Models: Current Epoch and Time Dependences, Neutrinos, and Helioseismological Properties”. The Astrophysical Journal 555 (2): 990–1012. arXiv:astro-ph/0212331. Bibcode: 2003PhRvL..90m1301B. doi:10.1086/321493. ^ Salaris, Maurizio; Cassisi, Santi (2005). 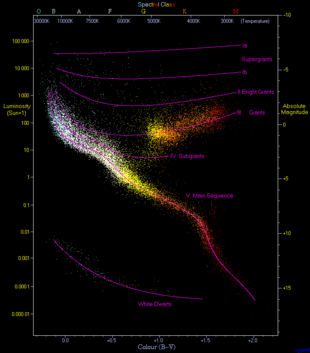 Evolution of Stars and Stellar Populations. John Wiley and Sons. p. 128. ISBN 978-0-470-09220-0. ^ Oey, M. S.; Clarke, C. J. (2005). “Statistical Confirmation of a Stellar Upper Mass Limit”. The Astrophysical Journal 620 (1): L43–L46. arXiv:astro-ph/0501135. Bibcode: 2005ApJ...620L..43O. doi:10.1086/428396. ^ Ziebarth, Kenneth (1970). “On the Upper Mass Limit for Main-Sequence Stars”. Astrophysical Journal 162: 947–962. Bibcode: 1970ApJ...162..947Z. doi:10.1086/150726. ^ Burrows, A.; Hubbard, W. B.; Saumon, D.; Lunine, J. I. (March 1993). “An expanded set of brown dwarf and very low mass star models”. Astrophysical Journal, Part 1 406 (1): 158–171. Bibcode: 1993ApJ...406..158B. doi:10.1086/172427. ^ Aller, Lawrence H. (1991). Atoms, Stars, and Nebulae. Cambridge University Press. ISBN 978-0-521-31040-6. ^ Bressan, A. G.; Chiosi, C.; Bertelli, G. (1981). “Mass loss and overshooting in massive stars”. Astronomy and Astrophysics 102 (1): 25–30. Bibcode: 1981A&A...102...25B. ^ Padmanabhan, Thanu (2001). Theoretical Astrophysics. Cambridge University Press. ISBN 978-0-521-56241-6. ^ Wright, J. T. (2004). 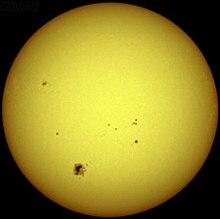 “Do We Know of Any Maunder Minimum Stars?”. The Astronomical Journal 128 (3): 1273–1278. arXiv:astro-ph/0406338. Bibcode: 2004AJ....128.1273W. doi:10.1086/423221. http://adsabs.harvard.edu/cgi-bin/bib_query?arXiv:astro-ph/0406338 2007年12月6日閲覧。. ^ Tayler, Roger John (1994). The Stars: Their Structure and Evolution. Cambridge University Press. ISBN 978-0-521-45885-6. ^ Sweet, I. P. A.; Roy, A. E. (1953). “The structure of rotating stars”. Monthly Notices of the Royal Astronomical Society 113 (6): 701–715. Bibcode: 1953MNRAS.113..701S. doi:10.1093/mnras/113.6.701. ^ Green, S. F.; Jones, Mark Henry; Burnell, S. Jocelyn (2004). An Introduction to the Sun and Stars. Cambridge University Press. ISBN 978-0-521-54622-5. ^ a b Prialnik, Dina (2000). An Introduction to the Theory of Stellar Structure and Evolution. Cambridge University Press. ISBN 978-0-521-65937-6. ^ Schröder, K.-P.; Connon Smith, Robert (May 2008). “Distant future of the Sun and Earth revisited”. Monthly Notices of the Royal Astronomical Society 386 (1): 155–163. arXiv:0801.4031. Bibcode: 2008MNRAS.386..155S. doi:10.1111/j.1365-2966.2008.13022.x. ^ Arnett, David (1996). Supernovae and Nucleosynthesis: An Investigation of the History of Matter, from the Big Bang to the Present. Princeton University Press. ISBN 978-0-691-01147-9. —Hydrogen fusion produces 8×1018 erg/g while helium fusion produces 8×1017 erg/g. ^ For a detailed historical reconstruction of the theoretical derivation of this relationship by Eddington in 1924, see: Lecchini, Stefano (2007). How Dwarfs Became Giants. The Discovery of the Mass-Luminosity Relation. Bern Studies in the History and Philosophy of Science. ISBN 978-3-9522882-6-9. ^ a b Rolfs, Claus E.; Rodney, William S. (1988). Cauldrons in the Cosmos: Nuclear Astrophysics. University of Chicago Press. ISBN 978-0-226-72457-7. ^ Sackmann, I.-Juliana; Boothroyd, Arnold I.; Kraemer, Kathleen E. (1993-11). “Our Sun. III. Present and Future”. Astrophysical Journal 418: 457–468. Bibcode: 1993ApJ...418..457S. doi:10.1086/173407. ^ Hansen, Carl J.; Kawaler, Steven D. (1994). Stellar Interiors: Physical Principles, Structure, and Evolution. Birkhäuser. p. 28. ISBN 978-0-387-94138-7. ^ Laughlin, Gregory; Bodenheimer, Peter; Adams, Fred C. (1997). “The End of the Main Sequence”. The Astrophysical Journal 482 (1): 420–432. Bibcode: 1997ApJ...482..420L. doi:10.1086/304125. ^ Icko Iben (2012-11-29). Stellar Evolution Physics. Cambridge University Press. pp. 1481–. ISBN 978-1-107-01657-6. https://books.google.com/books?id=IU357EiecWwC&pg=PA1481. ^ Adams, Fred C.; Laughlin, Gregory (April 1997). “A Dying Universe: The Long Term Fate and Evolution of Astrophysical Objects”. Reviews of Modern Physics 69 (2): 337–372. arXiv:astro-ph/9701131. Bibcode: 1997RvMP...69..337A. doi:10.1103/RevModPhys.69.337. ^ Girardi, L.; Bressan, A.; Bertelli, G.; Chiosi, C. (2000). “Evolutionary tracks and isochrones for low- and intermediate-mass stars: From 0.15 to 7 Msun, and from Z=0.0004 to 0.03”. Astronomy and Astrophysics Supplement 141 (3): 371–383. arXiv:astro-ph/9910164. Bibcode: 2000A&AS..141..371G. doi:10.1051/aas:2000126. ^ Doran, Emile I.; Crowther, Paul A. (2011). “A VLT/UVES spectroscopy study of O2 stars in the LMC”. Société Royale des Sciences de Liège (Université de Liège) 80: 129-133. Bibcode: 2011BSRSL..80..129D. ^ Crowther, Paul A. et al. (2010). “The R136 star cluster hosts several stars whose individual masses greatly exceed the accepted 150 M⊙ stellar mass limit”. Monthly Notices of the Royal Astronomical Society 408 (2): 731-751. arXiv:1007.3284. Bibcode: 2010MNRAS.408..731C. doi:10.1111/j.1365-2966.2010.17167.x. ISSN 00358711. ^ Krauss, Lawrence M.; Chaboyer, Brian (2003). “Age Estimates of Globular Clusters in the Milky Way: Constraints on Cosmology”. Science 299 (5603): 65–69. Bibcode: 2003Sci...299...65K. doi:10.1126/science.1075631. PMID 12511641. Arnett, David (1996). Supernovae and Nucleosynthesis. Princeton: Princeton University Press. Bahcall, John N. (1989). Neutrino Astrophysics. Cambridge: Cambridge University Press. Bahcall, John N.; Pinsonneault, M.H. ; Basu, Sarbani (2001). “Solar Models: Current Epoch and Time Dependences, Neutrinos, and Helioseismological Properties”. The Astrophysical Journal 555 (2). Barnes, C. A.; Clayton, D. D.; Schramm, D. N., eds (1982). Essays in Nuclear Astrophysics. Cambridge: Cambridge University Press. Bowers, Richard L.; Deeming, Terry (1984). Astrophysics I: Stars. Boston: Jones and Bartlett. Carroll, Bradley W. & Ostlie, Dale A. (2007). An Introduction to Modern Astrophysics. San Francisco: Person Education Addison-Wesley. ISBN 978-0-8053-0402-2. Chabrier, Gilles; Baraffe, Isabelle (2000). “Theory of Low-Mass Stars and Substellar Objects”. Annual Review of Astronomy and Astrophysics 38: 337. Chandrasekhar, S. (1967). An Introduction to the study of stellar Structure. New York: Dover. Clayton, Donald D. (1983). Principles of Stellar Evolution and Nucleosynthesis. Chicago: University of Chicago. Cox, J. P.; Giuli, R. T. (1968). Principles of Stellar Structure. New York City: Gordon and Breach. Fowler, William A.; Caughlan, Georgeanne R.; Zimmerman, Barbara A. (1967). “Thermonuclear Reaction Rates, I”. Annual Review of Astronomy and Astrophysics 5: 525. Fowler, William A.; Caughlan, Georgeanne R.; Zimmerman, Barbara A. (1975). “Thermonuclear Reaction Rates, II”. Annual Review of Astronomy and Astrophysics 13: 69. Hansen, Carl J.; Kawaler, Steven D.; Trimble, Virginia (2004). Stellar Interiors: Physical Principles, Structure, and Evolution, Second Edition. New York: Springer-Verlag. Harris, Michael J.; Fowler, William A.; Caughlan, Georgeanne R.; Zimmerman, Barbara A. (1983). “Thermonuclear Reaction Rates, III”. Annual Review of Astronomy and Astrophysics 21: 165. Iben, Icko, Jr (1967). “Stellar Evolution Within and Off the Main Sequence”. Annual Review of Astronomy and Astrophysics 5: 571. Iglesias, Carlos A.; Rogers, Forrest J. (1996). “Updated Opal Opacities”. The Astrophysical Journal 464: 943. Kippenhahn, Rudolf; Weigert, Alfred (1990). Stellar Structure and Evolution. Berlin: Springer-Verlag. Liebert, James; Probst, Ronald G. (1987). “Very Low Mass Stars”. Annual Review of Astronomy and Astrophysics 25: 437. Novotny, Eva (1973). Introduction to Stellar Atmospheres and Interior. New York City: Oxford University Press. Padmanabhan, T. (2002). Theoretical Astrophysics. Cambridge: Cambridge University Press. Prialnik, Dina (2000). An Introduction to the Theory of Stellar Structure and Evolution. Cambridge: Cambridge University Press. Shore, Steven N. (2003). The Tapestry of Modern Astrophysics. Hoboken: John Wiley and Sons.